From their trademark black and white coat to their signature scent, skunks are easily recognized. You may fear that if you see a skunk in your yard, you and your pets could be at risk of contracting rabies. 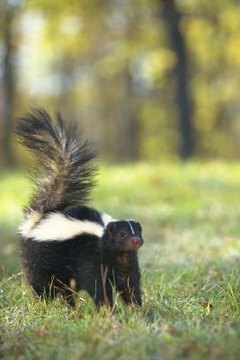 While skunks are one of the most common carriers of rabies you’ll find in your yard, only a rabid skunk poses a danger. Rabies is a disease caused by a virus that infects the central nervous system in mammals. While it’s often said that skunks are “carriers” of rabies, they can only transmit the virus to another animal when they are rabid, meaning the virus is no longer dormant and symptoms are present. Rabies is transmitted in saliva when a rabid skunk bites another animal. Skunks cannot spread rabies through urine, feces or even via their unpleasant spray, even if the skunk is rabid. There are two ways in which rabies can present. Either the skunk will become aggressive, called the “furious” form of rabies, or he’ll display a complete lack of fear of humans or other animals called the “dumb” form. Furious rabies, where a skunk grows aggressive and foams at the mouth is the most recognized form of the disease and the most likely to lead to a disease-spreading bite. If a skunk wanders into your yard and seems totally fearless of your presence and wanders around disoriented, he may have the “dumb” form. Healthy skunks will typically run away from people or pets, shooting off a dose of foul-smelling spray to keep them away. It’s often believed that skunks all carry rabies, but this isn’t true. Just like you or any other animal, a skunk has to be infected with rabies by being bitten by rabid animal. Skunks can contract the virus but not show any symptoms for up to 6 months. However, even an infected skunk cannot spread rabies unless the disease is active and he is showing symptoms. While many like to blame skunks for rabies infections in people or pets, it isn’t fair for them to take all the blame. While rabies is almost always fatal, deaths from rabies are extremely rare. According the Humane Society of the United States, there are only about three deaths a year from rabies nationwide. Most cases of rabies in humans are not from skunk bites, but from bat bites, and the number of bats that have rabies is less than 0.5%. Always avoid wild animals, especially if they don’t seem afraid of you or they look mangy, aggressive or sickly. Keep your furry pals vaccinated against rabies. Check the laws in your area regarding how often your pets should be vaccinated.